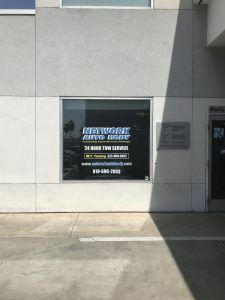 An existing customer of ours, Network Auto Body, reached out to us for a window graphic. They have many locations throughout Southern California, and this window graphic was installed at their Glendale, California location. From the photo, you can see that this one window graphic was used to display a lot of different information. The main information you want to have is your company logo. After that, it depends on the client what else they want to include. Network Auto Body not only listed their contact information by putting their phone number and website, they also have the number for a 24-hour tow service. Since the shop itself is not open 24/7, this can be very helpful to people who need towing services after hours. Having your contact information up can also help out people who come by after hours so they can still visit the website for information, or save the phone number to call during business hours. When starting on a window graphic, we need the measurements of the window along with what is going to be on it. This will help us properly scale the information to fit in the space. Then, we determine the best way to make the graphics. These window graphics had a combination of white text, yellow text, and blue text with a white border so we decided to digitally print the yellow and blue portions onto white vinyl. The graphics were laminated, contour cut, and applied to the glass. Window graphics can be used to display information, artwork, and virtually anything you want. We can also print on perforated vinyl which can cover entire windows, but due to the perforation, you can still see out the window while people outside just see the artwork. If you own a business and are looking to take advantage of your window space for advertising, give us a call!